Preheat oven to 400 degrees and line two baking sheets with parchment paper. Mix the bread crumbs, Parmesan cheese, parsley, salt, and pepper together in a shallow pie dish or a deep plate. Mix the butter, lemon juice and garlic together in a second shallow pie dish or deep plate. Dip both sides of the chicken in the butter mixture, coating it well. 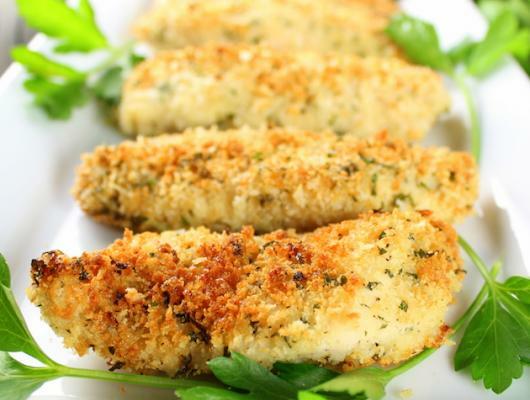 Quickly place the chicken on the bread crumb mixture and toss the crumbs up over the edges and top of chicken breast, using either your hands or a spoon. Gently press the chicken so the crumbs on the bottom side stick to the chicken. Now turn the chicken over and again press that side into the crumbs. Arrange breaded chicken strips on the baking sheet and repeat steps 3 and 4 with the rest of the chicken. When all chicken is prepped, bake uncovered (on the middle rack of the oven) for 20 minutes or until a meat thermometer reads 165 degrees when inserted in the thickest part of the chicken breast. If strips aren't as golden as desired, reduce the bake time by one minute and broil on the middle rack of the oven for one minute. Be sure to watch them closely to make sure they don't burn. Recipe Notes: If the butter and lemon juice mixture starts to congeal, microwave for 20 seconds. Be sure to use grated parmesan cheese, shredded cheese won't stick to the chicken as nicely. 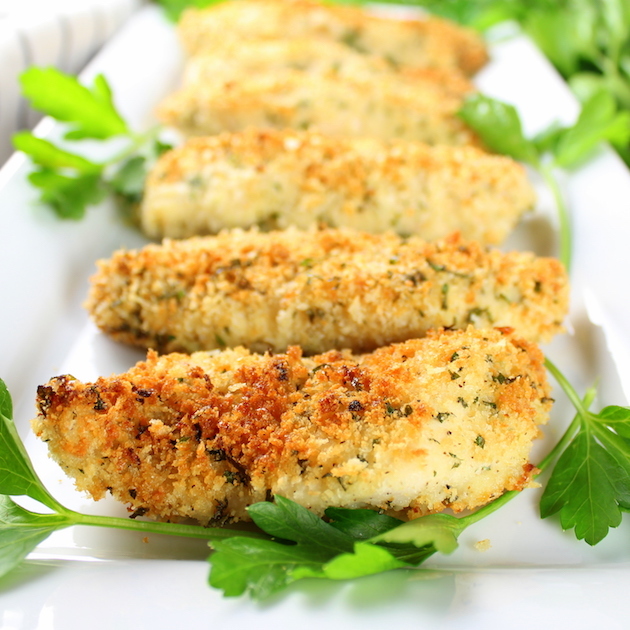 Parmesan Baked Chicken Strips Recipe - golden, tender & juicy. Coated in a cheesy crust w/ a marinara dipping sauce, the whole family will love these!